Kris Hermanns is a relatively new face at the long-established Seattle Foundation, which manages more than $1 billion in philanthropic investments, but she is a veteran of the nonprofit world who has earned a national reputation as a champion of equity and a community foundation leader. This past January, Hermanns took on the role of chief impact officer at the Seattle Foundation, an executive position that entails overseeing the foundation’s existing philanthropic and program initiatives as well as developing new strategies and innovative programs. 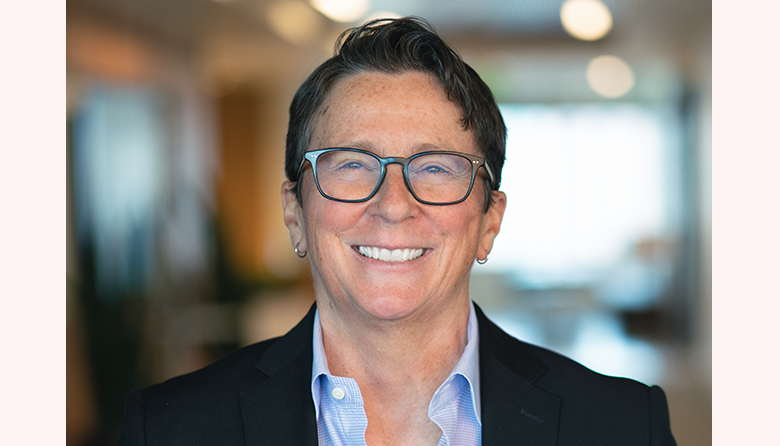 Hermanns previously served for some six years as chief executive officer of the Seattle-area Pride Foundation, which is focused on advancing equity and justice for the LGBTQ community. Prior to that role, Hermanns served as deputy director of the National Center for Lesbian Rights, which is based in San Francisco. Hermanns earned a master’s degree in education focused on administration, planning and social policy from Harvard University and a bachelor’s degree in political science from the University of Wisconsin-Madison. As part of the latest Daring Woman interview, Hermanns shares some insights about the barriers faced by women seeking to attain leadership roles and ways to overcome them, her views on mentors and networking, and she also shares some advice for women starting out in their careers. Good leaders understand the importance of living in the gray and getting comfortable with the unavoidable ambiguity of our complex world. Rather than seeing things in black and white, right or wrong, good or bad, leaders must be able to genuinely hold and balance divergent viewpoints at the same time, understanding that individuals and groups may have different truths ― and then using that information to make difficult decisions about what is best in that moment guided by values, principles and purpose. Cultivating this mindset is especially helpful in dynamic and discordant situations when leaders are challenged to be adaptive and agile. I find in my new role as Chief Impact Officer at Seattle Foundation that these characteristics are particularly helpful as we undertake some unprecedented efforts, bringing together cross-sector tables to advance scalable, inclusive and equitable growth and prosperity in our region. An overrated leadership trait is being an all-knowing, omnipotent-seeming leader with all the answers. Instead, what is more important is valuing the importance of listening, getting input and ideas, being willing to be flexible and have your mind changed, recognizing that there often isn’t one right answer, and being open that you may not know what you don’t know. I also think that leading to disrupt for the sake of breaking things is overrated. Tearing things down and apart, or interrupting, are important steps. They’re just not the only steps to greater impact. It works if you’re interrupting in order to get people to think and act differently for a particular outcome that you’re clear about. Problem-posing and problem-solving need to be done hand in hand. Historically women have been locked out of certain fields, certain roles and certain spaces because of assumptions about our capabilities and what we should and should not be doing. This has resulted in women’s access to social, political and financial capital being severely curtailed. In turn, these barriers have significantly compromised women’s access to realize their full potential as leaders. While we are making progress in changing access and inclusion for women in many arenas, there is still a long way to go, especially for women of color. There are two key factors: centering relationships and bringing excellence. When you have genuine relationships — where there is a sense of trust that you are someone who has the expertise or experience to deliver what is needed — supervisors and colleagues will keep you in mind when an opportunity emerges and be an advocate for you. Leaders want to surround themselves with talent that makes the team and organization more effective and more impactful. Be sure to demonstrate what you have to offer prominently, take credit for your work and contributions, and lift up the work and capabilities of others on your team. When I was at the University of Wisconsin-Madison as an undergrad, I did an internship at the Wisconsin Department of Human Services, Office of Child Support. The director, Ada Skyles, was one of my supervisors. She led with a deep sense of goodness and a lot of smarts that kept her centered on what was most important — the people the department was serving, who were most often single mothers and their children. Ada demonstrated the lesson of leading a principled life — understanding what you will not compromise on and knowing yourself well enough to know what that means. She led in a very difficult and politicized environment, where there’s pressure to make expedient decisions that are not human-centered. Ada reminded all of us that people’s lives are impacted by our work and that we need to keep their experiences in mind because they have been given very little power to shape that themselves. She did all of that and more, carrying herself with incredible purpose and joy. My advice is: Know what matters to you. When you know yourself well enough to make your own choices about places and positions you want to be in, you can develop purposeful relationships that are anchored by your values and the vision you have for your life. That really allows you to be present to opportunities before you and to draw out the best of the people around you. When I advised students at Brown University, I always urged them to put themselves in a lot of different positions to get a full sense of what’s possible. While many times we don’t necessarily know what we want, you can get a sense of what you don’t like and then you can take that off your list. Reflection like this means you can put your whole self in and chart the path that works for you as you understand yourself more. Obviously, networking is important because most opportunities come to people because of the people they know and the places they are positioned in. But, we’ve gotten to a place where networking is transactional. Networking used to be about the humanistic side of our lives and relationships. It’s become more expediency, numbers and degrees of separation. I think it’s important to show up authentically with the hope of connecting — not just with the intention that you’re going to get something out of it. Networking needs to be about listening, being present and meeting people who may inspire you and who you want to be around just because of who they are. The possibilities that follow from genuine relationships are much broader and deeper than one-dimensional connections with the immediate goal of some kind of exchange. I actually would not do anything differently. I never had a set career path. My journey has been eclectic, based a whole lot on serendipity. It naturally grew out of the people I was surrounded by, the places I was in, and the purposefulness of the work I was doing. Everything in my career has happened as a result of a door being opened through an existing relationship. So, I’ve always just kept myself open to the possibilities that would emerge in a moment in time in my life. You can usually find me outdoors on a Saturday afternoon — enjoying a round of golf, hiking or walking the arboretum in the company of my partner, good friends and family. Both my parents grew up on farms. When I was growing up, I worked on my grandparents’ dairy farm in a rural village in Wisconsin. The lessons that I learned were profound — about community, perseverance, discipline, effort, patience and care — and these lessons have stayed with me. I also learned that most things are out of my control, which is a valuable insight that I draw on every day.